This is a picture of my elbow. One day I realized that the lump was disappearing and thought I'd better get a picture of it because soon it would be gone. It is gone! When I was about fifteen years old (1967) I started to develop calcium deposits. I had repeated surgeries to remove the calcium lumps waiting until they reach a size that restricted movement. 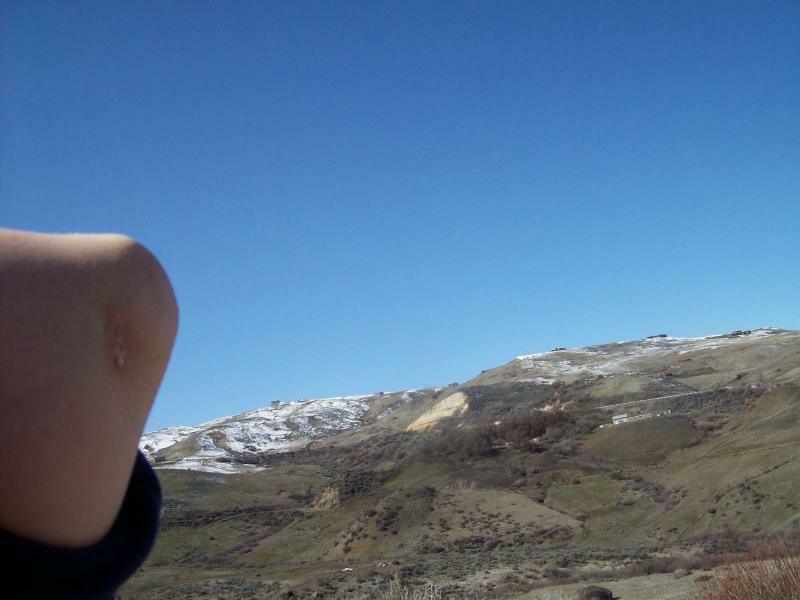 I first noticed a calcium deposit on my elbow and was taken to a Dr. Taylor in Boise. I was scheduled for outpatient surgery. The doctor thought it was a small lump unattached to anything. When Dr. Taylor got inside (1968 or 9) he found that the lump was larger than expected and growing inside the elbow joint. He could not remove it without replacing the joint and I chose (fortunately) to leave part inside and was told by the surgeon that I would never have full and complete range of motion from my left elbow again. I was given a choice and chose to keep the joint and the calcium that went with it. I was diagnosed at that time with an autoimmune disorder called calcinosis universalis. This manifest itself as calcium deposits of calcium salts, generally near the joints, on the connective tissues and also on subcutaneous tissues. Calcium deposits would form on my connective tissues for no rhyme or reason, or so it seemed. Glad to have my elbow, I worked hard at regaining the use of it after the surgery. Because some was left inside there were complications and it took a long time to heal as often the surgery scar would break open and drain. I also picked up a staph infection in the hospital. My arm swelled up so large a one time that the doctor debated cutting lines in my skin so that it would not tear. Eventually a keloid scar formed and the doctor suggested plastic surgery. I rejected the surgery feeling it was too expensive and that the growth might return, especially where some of it was still in my elbow. I could predict the weather quite well as the barometric pressure changes would signal pressure and aching in the joint and I would joke about it. Soon after deposits were formed on my wrists and often would break open and weep a white liquid. I had one or two removed and they were clean removals with little scarring. In about ten years I met a Dr. Richardson from Idaho Falls(deceased)who used a kill and draw salve to assist me in removing the calcium deposits. I had since grown more and my elbow was constantly irritated and sore because there is not a whole lot of room in that area for extra calcium to grow. I used it three different times to remove lumps and on one time I used it on the lump that had been attached to my elbow. It was interesting and exciting to actually feel the calcium leave the joint, and it did, completely. The kill formula would burn holes in my skin and the draw formula would draw out the calcium which I could then remove. First saucer shaped disks of calcium slightly less than ¼ inch across would emerge and I could stick a pin in them and pick them off the lump itself. Eventually the entire lump would loosen and could be removed. It was rather an interesting, if a bit painful, process. In 1981 the last large lump was gone for good. When I was about forty the other elbow also began to form deposits and in 1992 and 1997 I have had surgeries on that one. The lump was growing again and I had it checked out a few years ago. Our agreement was that when it became a bit bigger he would remove it again. The trick was to wait unitl it was a farly good size to eliminate as much surgery as possible, but to catch it before it got so large that it invaded the elbow joint or did other damage. Meanwhile the left elbow seemed to be growing a lump again. In 2006 I started growing yet another lump, this time near my left eye. It appeared at exactly the same time as I began to grow cataracts which are calcium deposits in the lense tissue of the eye. I had cataract surgery in May and June of 2006. I attribute two sources to the healing of the disorder. Dr Wilcher from Boise Idaho, a fantastic healer, put me on a calcium supplement that my body metabolized better, stopping the growth of the deposits completely. Working with my NLP coach, I set an intention to be completely free of the deposits. Then the work began. One by one my mind presented to me experiences in life that had impacted me in a negative way. To me it appears that I stored them on my body. Soon after I brought the entire calcium thing up to Dr. Wilcher as it seemed that they were all related. He put me on a different calcium product that literally stopped the growth of the lumps in their little lumpy tracks. Still the lumps were there. He had recommended for me to consult with an NLP coach on diabetes. I had excellent results and decided to try NLP with the little lumps here and there. Sharalee Clawson, M.NLP, started with a work on hypnotic suggestion on September 19th of 2007. It was interesting to me, as time went by, after this process, events in my life that I must have stored on my body, would present themselves. With NLP processes we would go back and revisit those events, taking care of needs and nurturing the me of long ago. Sometimes she would guide me though processes and we would work together, and sometimes I would work through processes myself. If you are into NLP you might recognize some of the processes such as Changing Personal History, Time Line and Changing Belief Work. I am also a firm believer in Jesus Christ and have prayed, and sought after Priesthood blessings from church elders in the process. Dr. Wilcher says that everything we need to heal is in the universe. God created that universe and I believe that his healing light is everywhere. NLP skills also help me to find that light and step into it to be healed. It was interesting. When a different event in my life would present itself, I would work it through, either with Sharalee or by myself, then I would not the lump had shrunk a bit more a few days later., Once after a process the calcium literally emerged through my skin and sloughed off. That was really interesting as I had never seen anything like that before. One of the most incredible occurrences happened one day as my husband and I were traveling to Utah. As he drove I had time to relax and think, a precious commodity for a special education teacher. A past impacting relationship presented itself to my mind. Using NLP skills I looked at that relationship in a new way. What had I needed then in my timeline of life that I did not have? I provided those tools I had needed then and nurtured my past self. My elbow began to itch and Incredibly, bits of calcium extruded from my skin and just flaked off. The same thing happened with a calcium deposit near my eye. I recalled that at the same time it appeared I had been remembering a past teen age conflict. As the conflict was nurtured and healed, the calcium deposit just simply slipped away. So what kind of experiences was I storing on my connective tissues? Everyone goes through life with little things that irritate or hurt you. Things that maybe the person who did it may not even realize that you had been hurt. One such event that it appears I was wearing on my elbow happened when I was a Senior in high school. I had pinned my dreams of being able to try out for a large dance program to be held in Salt Lake that year. I was a dancer and good. I did not know if I would win, but I knew I had a great change. I was so excited. I had been looking forward to the tryout for four years. I didn’t dare to dream of winning, but I did dare to dream of just being able to try out and have a chance. I knew the time would be soon and I wanted and watched and listened for the tryout call, but it never came. Finally I asked the dance director of the organization when the tryouts would be because I was wanting to try out. The dance director said she would find out. She called me aside a few days later and gently apologized. It seemed that a friend of mine’s mother was going up to Salt Lake and so those in charge had decided to forgo tryouts that year and just take her. It was the sensible thing to do. It meant some quality mother and daughter time for them before her daughter took off for college. She knew I wouldn’t be disappointed. I swallowed my dream and said “that’s OK.” Dreams coma and dreams go. I understood that. I guess a part of my body did not understand. Or maybe it understood too well. It knew how to store the disappointment and the hurt and even a feeling of being brushed aside as not a person with value and meaning. Maybe even knew how to protect me. My lump grew larger. In late November I had a talk with my elbow and asked it when it would be through with the process. It told me Christmas. Indeed on Christmas Day 2007 there was no more lump on my elbow. Not only that, there was no more lump on my right elbow either. I now have no calcium deposits anywhere on my body, and as I type this I looked down at my left arm and straightened my elbow absolutely straight and completely. There are no calcium deposits anywhere on me. Now the lump was gone, but left was that keloid scar. On a larch I asked Dr. Wilcher if he had anything. He prescribed a homeopathic called Silicea. He had me take 10 drops a day and rub a bit into the scar. Nothing seemed to happen and I asked him., He said it might take a while and I ordered a second bottle. I was dutiful in continuing the regimen and the first action occurred on September 6th 2009. That morning, as every morning, I washed and then rubbed a bit of oil into the scar to keep it soft. The upper end of the scar seemed to ask for attention and sort of itched so I scratched it and the knob of scar tissue simply sloughed off. Then I also noted that the white scar line down the middle had faded considerable. The scar that was almost 1 full inch long at one time is now less than ½ inch long. I took this at the same site as the first one. This was taken in 2010 and you can see that the scar has shrunk down significantly. Now it is November 2010 and it has been awhile since I have added to this. One night while I was asleep I dreamed of a past event in my life and it was a dream I do not recall at this time and I am sure it will come back to me, however, I knew what NLP program I needed and did it in my sleep, I can remember that clearly, the next morning while waking I noted that a bit of something extruded again through my skin and I brushed it off. When I got up later and checked it one of the two small remaining lumps had disappeared. Now there is just a very small lump left at the original site and even the scarring is faded.